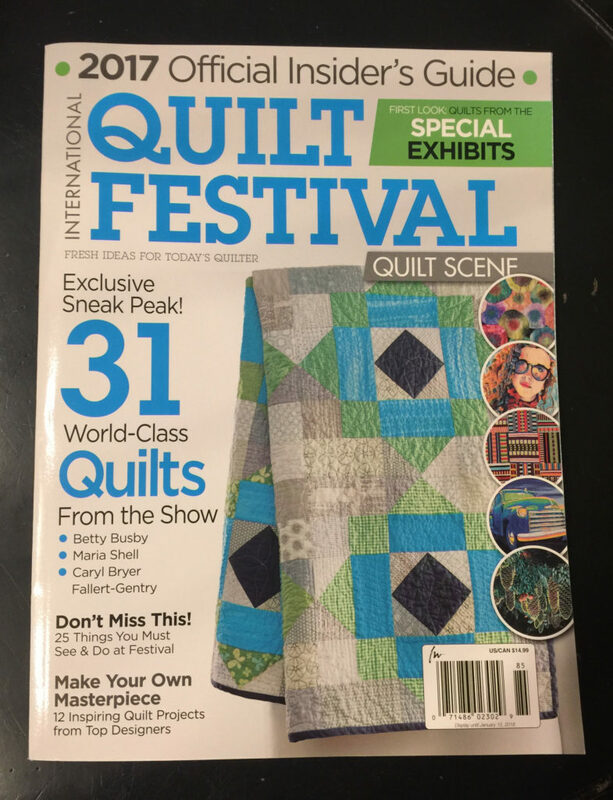 Art and Quilting in Camden and Hope » Blog Archive » Rising Stars exhibit and more in Quilt Festival/Quilt Scene mag! 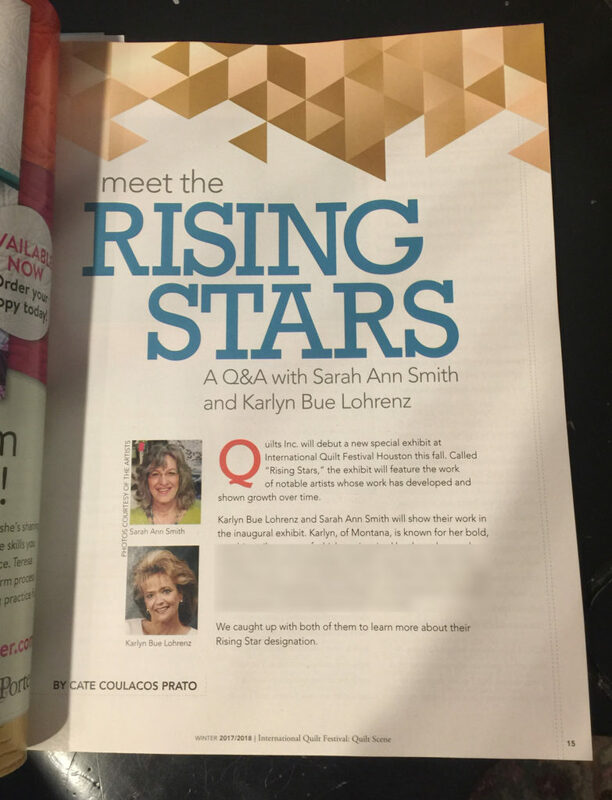 Rising Stars exhibit and more in Quilt Festival/Quilt Scene mag! Squee! Not only an article on the Rising Stars exhibit, but right at the front of the magazine! Thank you so much Cate Prato for writing the article and Vivika Hansen DeNegre for running it! There’s a couple more pages of interview with both of us. WOW…what a delightful surprise! 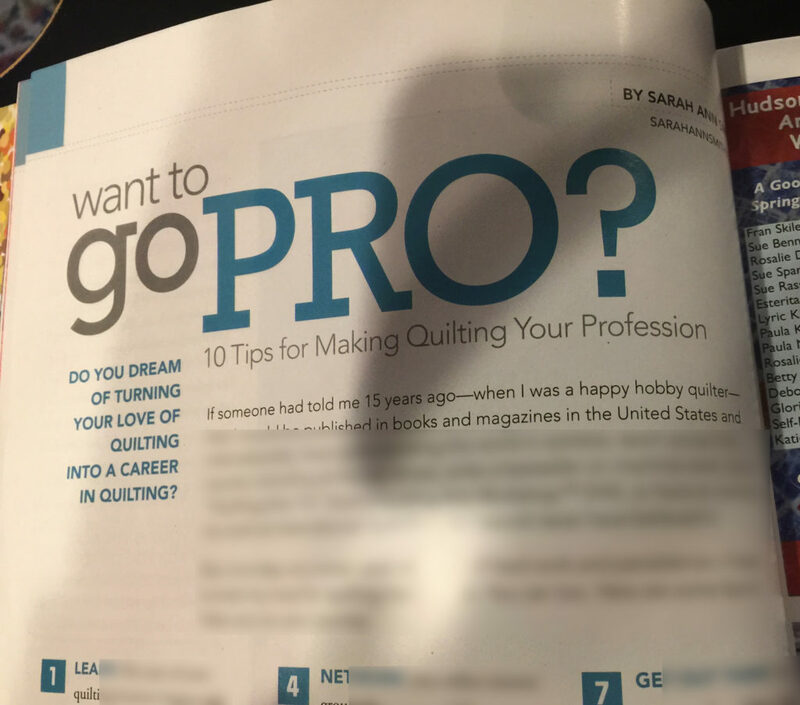 I knew I’d have a short 1-page article on “going pro” in Quilt Scene magazine. I had forgotten the interview–THANK YOU Cate–with Cate Prato about the Rising Stars exhibit, which is on p. 15, right up front, and then to have Widgeon featured in the Special Exhibits section of photos, too…wow! Can’t believe the contents, so delighted to share the pages with so many people whose work I admire. Can’t wait to see it “in the real” at Festival! My quickie article with ten tips from the years I’ve worked in the industry on how YOU can make your dream come true, too. Karlyn Bue Lorenz is the other Rising Star artist; her work is bold and colorful and abstract mostly, on left page. And of course that is our beloved Pigwidgeon on the right. Come see me at Festival–I’ll be at my exhibit more often than not and will do gallery tours 2 or 3 times a day (schedule will be posted at the exhibit), will be doing a Meet the Teacher panel discussion, and two Open Studios demos. See you there! 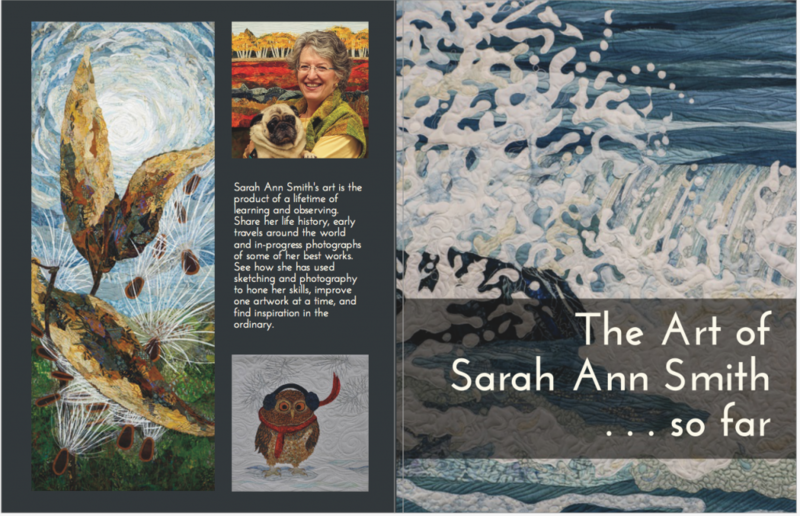 If you’d like to order my book, The Art of Sarah Ann Smith, you can do so with the hotlink on my store page or using this hotlink. The book is way more than an exhibit catalog: it includes all 24 works in the exhibit, plus 20 more, a bit about my life including photos of me as a wee kid, a senior in high school and a not-as-old-as-I-am-now mom, and some how-to tips and hints. 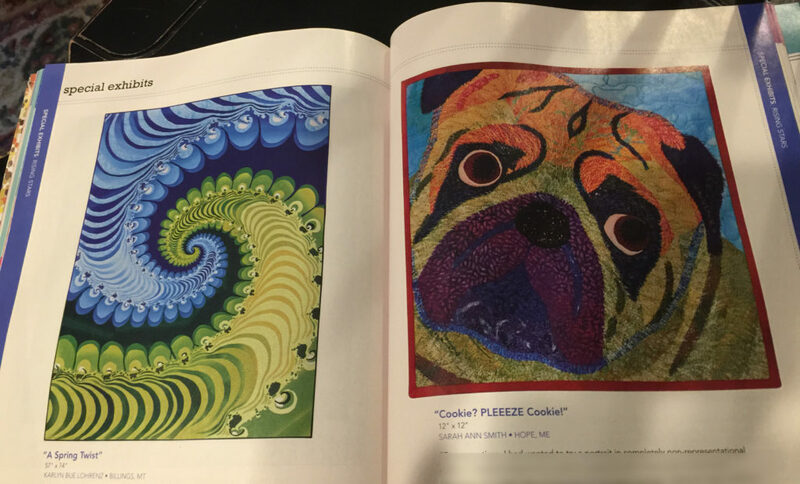 This entry was posted on Wednesday, October 25th, 2017 at 11:12 am	and is filed under art quilting, Be Happy!, Exhibiting, In a magazine!, International Quilt Festival, Interweave-Quilting Arts, Machine Quilting, Published!, Pug!, Quilt Market, Quilting Arts / Interweave. You can follow any responses to this entry through the RSS 2.0 feed. Both comments and pings are currently closed. This must be a thrill…. of a lifetime. Sad that I won’t be going to Houston this year, but I spent my wad on entertaining friends from South Africa this year. So what are you going to do for an encore? Not an encore, but I’m going to relax! That’s what I had originally planned for this year, then too much wonderful stuff came along. A very nice problem indeed! Congrats again! I am hoping to get some help with my edges after you recover from your trip. I’ve watched episode 7 on the DVD with you talking about the finishing. and will watch it some more. Not sure I know how to get the corners flat. but I trust you will give me some tips when you get time (as you said you would) after your very exciting trip to Houstan! Have a Great time!! I’d love to read the interviews too if you can maybe post a copy? Or is that not legal? The tips for being a pro sounds great – I should be so fortunate? I’m continuing making quilts as I can./ QQQ? Have you used 12 ounce canvas at all?